Welcome to Sangam Electronics Company. Manufacturer & Exporter of Power Products. We are an ISO 9001:2008 certified company, established in 1995, at Surat. We are certified by Onicra Credit Rating Certificate. Efficient after sale services & large production capacity help us to serve Clientele like Bank of Baroda, Anchor & HCL. Our product list covers Electronic UPS, Rechargeable Lights & Battery Chargers. 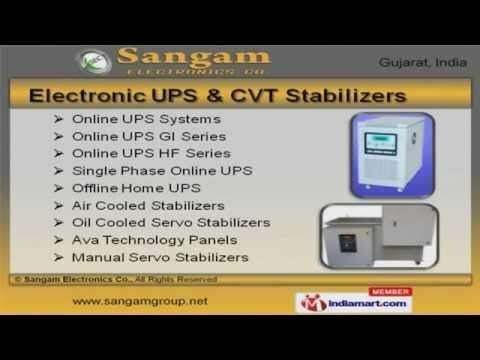 We are highly appreciated by the clients for offering a broad range of Electronic UPS & CVT Stabilizers. We are also engaged in offering quality assured Electric Inverter & Electrical Transformers for our respected clients. Our Rechargeable Lights & Currency Machines are some of our best selling products Our organization is highly appreciated by the clients for offering superior quality Britelite Torch & Battery Chargers. Shoe Polisher & Electronic Home Appliances offered by us are widely known for their low power consumption.